Nicotinamide Riboside has always given me a level of discomfort, due to the fact that this supplement has had a lot of money thrown at it marketing wise. Marketed as THE anti-aging pill by many scientists cashing in their credentials. The supplement is originally invented by Chromadex, also brand name known as Niagen. When research came out that NAD levels could potentially slow down or reverse aging. It just also happened that Chromadex had a compound that did that, but not in humans, nor are the doses close to what would be used in humans via allometric scaling. Similar to Reservatrol that came before it, Nicotinamide Riboside received Hollywood levels of hype, praise, marketing, news, and speculation, ultimately all the monetary interest in pushing people to buy the supplement suffocated whatever truth or function Nicotinamide Riboside provided based on evidence. So this research topic, we want to answer the question of - What exactly is Nicotinamide Riboside? Most importantly is it the real deal or just another overhyped supplement? “Research showing oral ingestion may simply CONVERT to NICOTINAMIDE in circulation, but injection would work to increase NR substantially, that NR works BETTER than NMN in assimilation into muscle. The active formation of liver NAD from NR and NMN is consistent with both compounds being subject to substantial hepatic first pass metabolism. In contrast, extrahepatic tissues displayed minimal M+2 NAD (Figure 2.7e), suggesting that orally delivered NR and NMN are converted into NAM before reaching the systemic circulation. IV injection of NR or NMN, on the other hand, resulted in substantial M+2 NAD in both liver and kidney. In the brain, we detected only M+1 NAD, indicating a reliance on circulating NAM and 34 suggesting that intact NR and NMN may not cross the blood-brain barrier. Interestingly, NR but not NMN was efficiently assimilated intact into NAD in muscle. To our knowledge, this is the first clear example of a differential metabolic effect between these two compounds in vivo. The primary finding of this study is that chronic oral supplementation with 1000 mg per day of NR is a well-tolerated and effective strategy for stimulating NAD+ metabolism in healthy middle-aged and older humans. We also observed a trend towards a reduction in carotid-femoral PWV after NR supplementation in the present study, suggesting that this measure of aortic stiffness may represent another promising cardiovascular outcome of interest for a larger future clinical trial. Our findings suggest that a relatively short (6-week) intervention with NR did not change total energy expenditure or energy expenditure from fat oxidation (based on assessment of RER) at rest. We also did not observe any improvement in blood glucose control or insulin sensitivity. In both cases, it is important to note that this study was conducted in lean, healthy middle-aged and older adults without baseline metabolic dysfunction. Our results also suggest that NR does not obviously improve aerobic exercise capacity or motor function in healthy middle-aged and older men and women with good baseline physical status. In summary, the results of the present study provide initial evidence that chronic NR supplementation is well-tolerated in healthy middle-aged and older adults, and extend recent findings that acute supplementation with NR is effective for stimulating NAD+ metabolism in humans. Furthermore, we provide the first insight into the effects of NR supplementation on physiological function in humans, and identify SBP and aortic stiffness as promising cardiovascular outcomes to be assessed in larger-scale clinical trials. Future work should also compare the relative increases in NAD+ and the physiological benefits of NR with conventional CR in order to further evaluate the use of this dietary supplement as a true “CR-mimetic” compound. “The data show that nicotinamide riboside, the most energy-efficient among NAD precursors, could be useful for treatment of heart failure, notably in the context of DCM, a disease with few therapeutic options. Paper Authors: Diguet N1, Trammell SAJ2, Tannous C1,3, Deloux R1,3, Piquereau J, Mougenot N4, Gouge A1, Gressette M3, Manoury B3, Blanc J1,3, Breton M3, Decaux JF1, Lavery GG5, Baczkó I6, Zoll J7, Garnier A3, Li Z1, Brenner C2, Mericskay M8. We show that the Nmrk2 gene is an AMP-activated protein kinase and peroxisome proliferator-activated receptor α responsive gene that is activated by energy stress and NAD+ depletion in isolated rat cardiomyocytes. Nicotinamide riboside efficiently rescues NAD+ synthesis in response to FK866-mediated inhibition of nicotinamide phosphoribosyltransferase and stimulates glycolysis in cardiomyocytes. Accordingly, we show that nicotinamide riboside supplementation in food attenuates the development of heart failure in mice, more robustly in DCM, and partially after transverse aorta constriction, by stabilizing myocardial NAD+ levels in the failing heart. Nicotinamide riboside treatment also robustly increases the myocardial levels of 3 metabolites, nicotinic acid adenine dinucleotide, methylnicotinamide, and N1-methyl-4-pyridone-5-carboxamide, that can be used as validation biomarkers for the treatment. Loss of NAD Homeostasis Leads to Progressive and Reversible Degeneration of Skeletal Muscle. Paper Authors: Frederick DW1, Loro E2, Liu L3, Davila A Jr1, Chellappa K1, Silverman IM4, Quinn WJ 3rd1, Gosai SJ4, Tichy ED5, Davis JG1, Mourkioti F5, Gregory BD4, Dellinger RW6, Redpath P7, Migaud ME7, Nakamaru-Ogiso E8, Rabinowitz JD3, Khurana TS2, Baur JA9. Administration of the NAD precursor nicotinamide riboside rapidly ameliorated functional deficits and restored muscle mass despite having only a modest effect on the intramuscular NAD pool. Additionally, lifelong overexpression of Nampt preserved muscle NAD levels and exercise capacity in aged mice, supporting a critical role for tissue-autonomous NAD homeostasis in maintaining muscle mass and function. “No positive effects on insulin resistance and glucose metabolism. Whilst it is ridiculous to cover everything about mitochondria here, it is worth summarizing why there was so much hype with a supplement that raises NAD in the first place. Mitochondria are the battery organs of cells, but they do much more than just create energy. They are essential for a cell's metabolic function by producing ATP. Mitochondria are also critical to something called proteostasis, a process where proteins are kept in shape by other proteins. Mitochondria keep in constant communication with the nucleus, relaying important information between the Mitochondria's own genome (mtDNA or mDNA) and the genome in the nucleus. There is a strong relationship between mitochondria and aging. 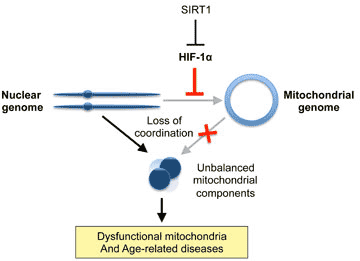 A lot of aging has to do with mitochondria becoming dysfunctional as we get older. Mitochondrial dysfunction eventually leads to a cell being unable to maintain its own protein leaving "wrong" proteins around creating plaques that form the basis for age-related diseases like Alzheimer's. Mitochondrial dysfunction can also lead to things like switching to cancer style metabolic processes. The general decline of metabolic production also reduces cellular energy, reducing the performing of the cells, such as weakening of muscles as we age. The critical role Mitochondria plays in our bodies is why it is labeled as one of the major hallmarks of aging. So you can see why restoring mitochondria is such a big deal. This is where NAD+ comes in. NAD+ is a key energy ingredient for mitochondrial function, as we age our NAD+ levels decline because the cell's ability to make NAD+ reduces due to natural aging. This decline in NAD+ level ultimately leads to mitochondrial dysfunction. Without NAD+ the mitochondria perform its job less and less and thus the cells begin suffering more and more problems, such as the accumulation of wrongly folded proteins (Alzheimer's). As you live proteins are also exposed to a constant battery of attacks by high glucose, high lipids. Basically, in chain effect cycle, because there is less energy for the mitochondria, it does less metabolism, and because it does less metabolism a whole bunch of stuff inside the cell also begins to suffer and break down, like if you got old and tired and you don't have the energy to clean your house anymore, so it just gets dirtier and dirtier. As if that wasn't enough, further research by David Sinclair (which resulted in the over-hyped under delivered Reservatrol), proved that restoring NAD+ levels are possible, and not only that NAD+ was also linked to sirtuin activation, another important mechanism to trigger anti-aging effects. But this is where supplementing Nicotinamide Mononucleotide (NOT RIBOSIDE) was shown that it RESTORED communications between a cell's nucleus and mitochondria, thus restoring the production of NAD+. Note that Nicotinamide Mononucleotide called NMN is NOT Nicotinamide Riboside. Nicotinamide Mononucleotide is something that is NATURALLY found in your cells and is the direct cause for the activation of sirtuins and levels of NAD+ (Nicotinamide Adenine Dinucleotide). So...If Nicontinamide Riboside is not NMN (the one in the pilot study). WHAT exactly is Nicotinamide Riboside, where does it come from and why is it sold as having the effects of NMN? This is what we want to know. What Exactly is Nicotinamide Riboside? When the research was released by David Sinclair, a company called Chromadex happened to be sitting on a type of nicotinamide, that had the promise of reliably increasing NAD+ levels. Since the study was all about NAD+ levels being linked with sirtuin activation, it was immediately jumped on as THE supplement that could replicate the effects of NMN (Nicotinamide Mononucleotide). This created a whole lot of confusion as the two chemicals are NOT the same thing. Nicotinamide Riboside is at best a very effective precursor to NAD, it is NOT the same chemical used by David Sinclair in his landmark study. So what exactly is Nicotinamide Riboside? Nicotinamide Riboside is basically a type of Vitamin B3. A pyridine-nucleoside to be specific. It is pretty much Nicotinamide (B3 supplement) plus a Riboside. It was discovered in 1944. There are many precursors to NAD, these include amino acid tryptophan, aspartic acid, nicotinic acid, nicotinamide and nicotinamide riboside. In fact NAD+ levels can be raised by just exercising. Does this mean Nicotinamide Riboside should be dismissed as simply hype and quackery? Nope. That's not the whole story - of all of the compounds stated above Nicotinamide Riboside is possibly the best precursor to NAD when it comes to efficacy, which is why Chromadex and people marketed it as the anti-aging pill. There is plenty of research showing NAD+ levels can be raised by Nicotinamide Riboside. Niacin (Nicotinic Acid) causes excessive flushing (red skin) at high doses, and both the cheaper Niacin and Nicotinamide results in less NAD+ bioavailable to cells compared with Nicotinamide Riboside (NR). In other words, Nicotinamide Riboside does readily convert into NAD+, so the idea that it may replicate the effect of David Sinclair's study is not off the mark at all. So Nicotinamide Riboside (NR) is not exactly the same drug as NMN, but it is speculated to cause a lot of similar effects. It's simple to think of it as the stop-gap between Reservatrol and NMN in terms of sirtuin activation. It isn't quite the magic chemical it is sold, but it isn't based on fake science either. The issue is more like, well how does it compare to other cheaper methods of raising NAD+? Does it raises NAD+ levels to amounts significant for anti-aging? How Effective is Nicotinamide Riboside? Comparison with Niacin and Nicotinamide. Whether supplementation of Nicotinamide Riboside can extend lifespan in humans is unknown at this time, this is because when it comes to lifespan, rat studies often do not translate to humans. Humans live much longer than rats, thus something that extends life expectancy in rats may not necessarily translate to humans and vice versa, but it is also equally true that rat and humans share a lot of similarities biologically. ^ For this reason - If NR worked like a calorie restriction mimetic - its effect may likely have little effect on human lifespan, resulting in 2 to 3 more years in human life span, but NR could yield benefits in terms of quality of life. Working from my understanding, since by 50 a typical person may only have half of the NAD+ levels they had when they were young - I would say that for people above age 40, increasing NAD+ levels should certainly improve cellular functions, but if NAD+ was supplemented too early it may be detrimental as it would create too much mitochondrial metabolism instead. 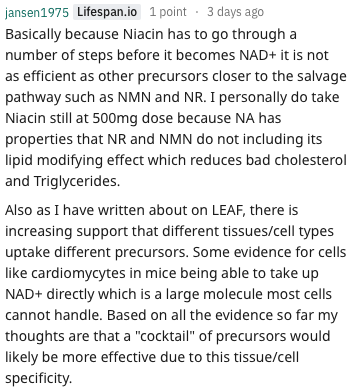 As you can see both Nicotinic Acid (NA) (Niacin) and Niacinamide/Nicotinamide (Nam) are "salvageable" precursors to NAD+ . NR does not provide a speedier route to NAD+ being also a 2-3 steps pathway (same as Niacin and Nicotinamide) . The hypothesis is that NR boosts NAD+ without inhibiting sirtuins (the problem with Nicotinamide/Niacinamide), without causing flushing (the problem with Niacin). Nicotinamide and Niacin also promote insulin insensitivity, this is proven in multiple studies with Chromadex and outside of Chromadex over many years. It is the entire reason NR was patented. On single celled organism, NR activates sirtuin at high concentrations, whilst Niacin and Niacinamide deactivate them at high concentrations, showing that NR does act differently than Niacin. Niacin pathway is not on in a lot of tissues like the brain and skeletal muscles, and Nicotinamide pathway declines with aging. Exactly how much more effective NR is vs the cheaper option is extremely unclear. (Needs work - anyone?). There is little doubt from recent research that Nicotinamide Riboside raises NAD+ levels in humans, the issue seems to be that the actual dosage required to replicate the anti-aging study is much higher than commercial supplements suggest. The most recent study by Sinclair put NMN (Not NR) in the drinking water of mice at the dosage of 400mg per kg of bodyweight, this would translate to SEVERAL GRAMS per day in humans and is way above what supplements currently recommend. It would translate to at least 6 capsules per day. Tissue examinations have also shown that both NR and NMN have low bio-availability via oral ingestion further bolstering the dosage issue. Research on Nicotinamide Riboside is an ongoing effort with lots going on, so this research topic likely needs to be a work in progress. In general, I cannot find any definitive proof that NR would work substantially better than other NAD+ precursors in humans, however, all research points out to it being able to raise NAD+ levels at sufficient dosage AND all research in lower organism models such as yeast and rodents hugely points towards Nicotinamide Riboside as being superior to Niacin and Niacinamide/Nicotinamide. If the hypothesis of NR's superiority holds true for humans as it does for yeast studies , then NR is indeed superior than Niacin and Nicotinamide. The lack of research comparing Niacinamide, Niacin and NR and the lack of research of NR on telomere length may have more insidious reasons such as the lack of financial incentive for such research to be performed, should the research yield negative results for the promotion of NR as a supplement. Good discussion regarding whether Nicotinamide (Nam) is any good. Since Nicotinamide is very well studied, there is a half chance that Nicotinamide Riboside is simply repackaged Nicotinamide. Decent evidence high doses of Niacin and Nicotinamide may be harmful to health. Despite the many conflicting research results, such as it being unclear if NR simply metabolizes into NAM (Niacinamide). My conclusion is that the majority of the research, Chromadex funded or not does weigh positively on NR. At this point in time there are indeed human studies showing increased NAD+ levels (without study of longer terms than 6 weeks). Human studies trump rat studies everytime. The reason for the confusion is that NR is not NMR and NR does not work by simply pushing NAD up. There is an abundance of NAD+ dependent processes, the effects of NR and NMN may depend on multiple targets including sirtuins, PARP familiy members, cADPribose synthetase and more. The study that NR does not work orally (gets converted to NAM) may be down to a methodological error, in which they stop measuring NAD after 135 minutes, even though NAD metabolic activity from other studies peaks after 6-8 hours not 2 hours, meaning the measurement simply may have been wrong time wrong place. Whilst Niacin and Nicotinamide may provide similar benefits as NR, at this point, there is reasonable evidence and consensus to show NR is indeed superior to the other two, the only question is by how much and is it worth the cost, and does NR really extend human life span or not. There are also plenty of studies that show NR works orally to replenish NAD (will link these aferwards). Humans also take NR for months making the mechanism and dynamics completely different than mice, and human studies show results. The truth of the matter is that NR is not NMR, and NMR that extended life of rats in David Sinclair's original study may be acting on a completely DIFFERENT MECHANISM. NR is likely to be a superior form of Niacin (If it doesn't just flat out get converted back to NAM after liver). It is marketed as NMR but IT IS NOT NMR. My view is if you are going to supplement Niacinamide you might as well go with NR, at worst you are still getting Niacinamide (Vitamin B3) which is a long known anti-aging supplement and just getting ripped off by some greedy scientists, at best you are getting something better. The biggest problem to me is effective dosages are in my opinion at least 1000mg from research and reports I've read. In general, the safety profile of Nicotinamide Riboside is stellar. The biggest concern to me is the potential for Nicotinamide Riboside to be metabolized orally to Niacinamide (Nicotinamide) via the first pass metabolism, at higher doses Niacinamide has many possible negative effects, it is one of the main reasons NR was developed and patented. For people over 40 NAD+ improvements certainly should help energy levels, for under 40 they may feel no difference, or even feel muscle tension and anxiety from too much mitochondrial activity. The loss of physical performance in animal models may have been a temporary one due to recycling of defective mtDNA and mitochondria. There are also anecdotal reports of positive effects waning after more than a month, this suggests tolerance to supplementing precursors this way may develop. It is possible for the liver to metabolize Nicotinamide Riboside better as an adaptation to increased NR, leading to more NAM in plasma than NR. It has also reported causing headaches through an unknown mechanism. A downside of B3 supplements like NR and Niacin and why Liz from SupplementClarity had negative effects with it is because it requires methyl donors, such as TMG (betaine). Throne's NR product contains TMG. (contributed by bio-hacker on r/longevity). The final downside is cost, it is unclear whether taken orally NR simply breaks down into NAM or not. There are more than 70 years of research on NAM, and NR has strong financial incentives for the industry to market it. Why Not Just Suppplement NADH+? Needs expanding if anybody knows. Copied from the supplementclarity.com, Liz Says: I am a 50 year old female in good health, but wanted to try Nicotinamide Riboside 250 mg for its anti-aging potential effect. I used the product manufactured by LifeExtension. I took it for 2 weeks. I didn’t really notice a beneficial effect beyond my normal supplements, such as CoQ10, curcumin, EPA/DHA, Red Panax Ginseng, Magnesium, and Acetyl L Cartinine. However, I did notice that I was getting low grade headaches every day that would worsen throughout the day, as well as some fatigue in the evening. One of my friends who hadn’t seen me in a while even mentioned that I “looked tired” and not my normal self. I immediately stopped taking the product and my headache went away and now I feel better. I’m not sure whether these symptoms were due to the product or were coincident with something else (stress?) I am building a new house, so that could be the cause. I’m going to start taking the product again in a few days. If the headaches and fatigue return, I can likely say it’s due to the product. I can report back my results. Has anyone else had these symptoms? Headache, neck tension/pain, and fatigue toward the evening that is unusual? Copied from Longecity.org | Oakman says: I'll speak up for the old folks being here. I'm not quite in my 70s yet, but a few months away. I've been on NR of some dose or other since Aug 2016. I'm not going to say it hasn't helped, but if you want me to put my finger on a specific 'wow' moment I realized NR was doing something wonderful...well...I can't. Nevertheless, for some reason I do feel it helps my overall health - and why I still take 250mg each AM. Why? IMHO one simple thing is a requirement for better health & aging using NR or any NAD+ precursor ... and that is cardiovascular exercise and lots of it. My opinion is if your body doesn't use much energy (couch potato), it will pretty much not use molecules presented to it. To keep heart, lungs, blood, muscles, etc. going well into 60s, 70, 80s, and beyond requires work, physical work, that uses the body as you did when you were younger. I believe NAD+ precursors offer that help. Don't want to do the work? Save your $$ - Precursors are more or less a waste. So Nate, I wish there was a "60s & up" thread for NR and another for NMN, and another for CD38, etc. ...Or maybe one NAD+ thread ONLY for over 60. I simply don't believe NAD+ precursors do much for healthy young people, and so their experiences are suspect as to what they say they get (sorry young people :) ) One the other hand - I would say I've experienced a 'Wow - that's something!" moment and more with NMN. Whatever is happening with NMN, it seems to be doing something especially good for my body - losing weight, strong muscles, lower heart rate with exceptional energy for exercise. That's something to get excited about, but them maybe what was required was the NR + NMN combo? Whatever, to hear from other 60s, 70s, 80s age people specifically would be great. ABN's recommendation for 4-8 doses a day seems like a huge marketing problem to me. I'd guess a lot of people get turned off by the inconvenience and cost. But in my experience it really works. I was taking 2 a day until I read someone suggest taking before and after exercise, so I added that (4 a day total), and it made a big difference for me. Then I saw their 4-8 a day call, I upped it to 8 a day - even better. 6 months ago, if someone told me I needed to take their pills 8 times a day I'd say no thanks. Surely sublingual NR would also benefit from more frequent dosages. Copied from Longecity.org | Oakman Says: I would think it also might help with homeostasis. IF a significant % of the NR/NMN gets used by other tissues before being filtered out by liver, there is that much less flooding the liver. To me, dumping a huge dose of NR/NMN in the liver to max out NAD+ would be more likely to result in homeostasis vs lots of little doses of NR/NMN direct to the blood/muscles/heart/etc. You don't depend as much on maximum Liver NAD+ to distribute to the rest of the body. Liu says that at 50 mg/kg, NONE of the NR/NMN escapes the liver. CD38 metabolizes to NAM, and is excreted from liver to bloodstream where other tissues must use their salvage pathway for NAD+. Yet clearly they have different effect than oral NAM. Some must escape the Liver. Studies that show effectiveness often use 300-400 Mg/kg a day. Does higher dosages result in more making it outside the liver? Trammel/Brenner show a 270% increase in liver NAD from a single dose of 1000 mg. That drops to 90% after 1 month, and 55% at 2 months (Elysium study). That is the homeostasis I am talking about - liver centric. Liu says that is the source for most NAD+ in the body. ( I don't recall - what happens to NAD+ levels in other tissues over months of supplementation? ) Is that due to more CD38 being utilized to keep NAD+ levels in liver lower, and is that bad or good or neutral? Perhaps that limits the amount of NAD+ that escapes the liver, and can be avoided or minimized by not relying entirely on the liver NAD+ levels to supply NAD+ elsewhere. That is why I think the frequent smaller dosages may work better.